How to cook rice for sushi? Rice is a staple of most Japanese dishes, which acquired in our country a lot of popularity. 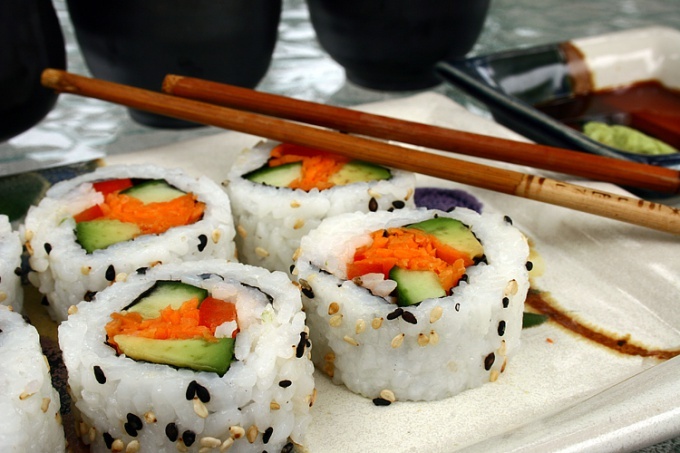 Many women began to prepare the rolls and sushi at home, but most of the time the question arises, how to cook rice, so they turned out beautiful and delicious. To make the sushi rolls and it turned out sturdy and delicious, it is necessary that the rice was sticky. And to cook it properly, you should choose the store good quarters. To select quality rice for sushi, it is best to go to the store, which specializiruetsya on the sale of products for Japanese cuisine or a major supermarket and buy there special rice. If you can't find grits, ideal for sushi, do not worry, purchase a regular kruglozerny Fig. With proper preparation it can turn out great rolls and sushi. Also buy the special sauce for cooking rice. In its composition should include ingredients such as rice vinegar, mirin, salt, kombu seaweed. It will give your rice a special taste, but also will facilitate the preparation of rolls, if during operation, to moisten the fingers. When the rice is selected, we have to learn how to cook for the further manufacture of rolls and sushi. This should be done in a pan with closed lid in a small amount of water without adding salt and other seasonings. Before cooking the rice rinse it in running water using a fine strainer or sieve. The water flowing from the clean rice should have a whitish hue. After washing, leave the product on for 20-30 minutes to dry. Prepare a deep pot, place the rice and fill it with water per Cup of rice (about 200g) a little more than a glass of water (about 300 ml). The water should completely cover the groats in the pan and go up about one fifth of the number that has been filled in Fig. To properly cook sushi rice, make sure about choosing an appropriate pan - it should be filled less than half. It is desirable that the bottom was thick enough for the product when cooking didn't burn. Cook the rice for rolls with the following sequence. Put on medium heat the pan with the rice and close the lid. Bring the water to a boil, reduce heat to low and simmer 10 minutes until completely absorbed water. To make the rice for sushi and rolls is cooked properly, under no circumstances do not open the cover, otherwise the rice will be hard due to heat loss. After switching off the plate, hold the pan covered for 10-15 minutes. In the boiled rice add 30 ml of rice vinegar, stir the mass with a wooden spatula. As you can see, cooking rice for sushi rolls and quite simple. Cool it to room temperature and cook your favorite dishes.